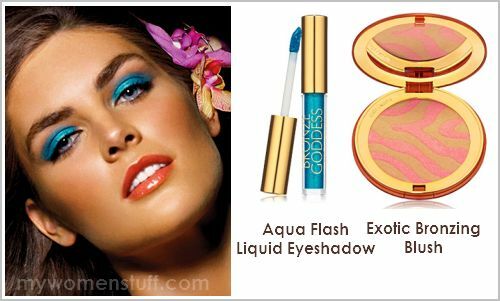 Anyway, the reason you are reading about the Estee Lauder Bronze Goddeess collection is because I was a little taken aback when I looked at the promotional picture I received in an email. Did anything untoward catch your eye? I love the teal colour of the new Liquid Eyeshadow in Aqua Flash (US$17.50). But do you notice that it isn’t blended much? Look a little closer below. It seems to break every cardinal rule in eye makeup i.e. blend your makeup to prevent harsh lines. Teal is not an easy colour to work with on the eyes and personally, I felt that the colour unblended, looks a bit harsh on the model and on very tanned skin. Blended, it would look amazing. So, what d’ya think about the teal on the eyes. Did you find it too harsh or did you think it looked great as is? 🙂 You can see the rest of the collection online. PREVIOUS POST: Dior Capture Totale One Essential Serum – One Serum to rule them all! I am new-ish to makeup so teal would be a color that might prove a challenge, hahaha. But its very pretty indeed!!! Individually the colours are all really pretty. But WHY are blue eyeshadow and oranage lips back? WHYYYY? It’s as bad as hammerpants! I love teals and that shade is gorgeous! I agree with you though, it should have been blended more. It looks a bit too harsh like that. Actually, I think unblended on this model is rather cool. Gives an edge to this collection. Her face and features are angular, lips neat, jaws strong. Why not a sharp eyeshadow? Perhaps a blended look would not be that attention grabing. Oh yeah, doesn’t work for everybody. I probably would look like I’m in the wayang show if I do that. I don think it look too harsh. but it does draw attention to the eyes if any1 is wearing this colour. its very beautiful and i tried this look once and it turn out very fresh and young. LOVE THAT COLOR! I have a huge weakness for teal. Might just try the look out but of course, with better blending. This collection is unreal! it’s one of the best collections from EL! seriously, you have to check it out and get something to try! I will once we get it 😀 Maybe try that bright teal and Exotic blush? 🙂 Thanks for the link love! Am I the only one loving the the eye makeup application on the model here? Granted, it’s certainly not something for every day wear …. but I think it’s gorgeous for an ad campaign and would certainly not be out of place at all on the runway. It really makes the model’s eyes pop and I can’t help staring at it! I can’t wait to get my hands on it! In fact, I agree with the above comment … the entire collection looks fabulous! The colour is definitely eye-catching! But you are right, it should be better if blended properly. I have not checked out EL for ages and it looks like they have been coming out with many interesting products. I love how it looks on the model, stunning is the word. I do not know how well would look on me 🙂 but all in all this collection looks great. Blended I am not sure it will look that well. Excuse me for butting in but….the hammerpants is back. 3/4 ones. On women. I saw 3 instances in my campus and frankly speaking, they look horrendous (the pants, not the ladies!). Wow, a blue liquid eyeliner for less than $18? That’s like a dream come true!